July has been busy .... busy with work, trip to Toronto, meeting friends, and knitting. It was also busy with discovering new yarn stores and getting additions to my stash. 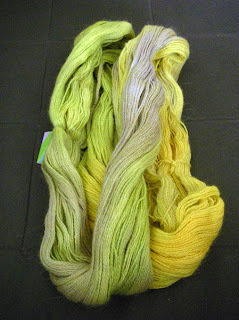 If you are looking for a place to get a lot of different yarn you have to go to Toronto's Romni Wools. I have read several reviews about the store. I also seen this picture on their website. I was expecting a big place but felt like it would be more of a warehouse and that I would not like it there. One thing for sure, the place is HUGE. It is the biggest yarn store I have seen so far. And yes, it has a bit of a warehouse-ish ambiance, but hey, they have SO much yarn that it is hard not to look like a warehouse. By the way, apart form different yarn they also carry a great selection of needles and hooks by different producers. 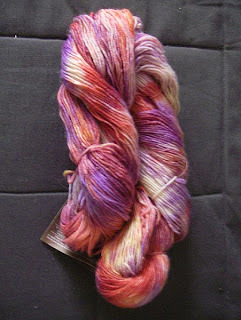 This is a beautiful sock yarn from Araucania. I will admit that the colour combination is not my first choice but since I have been stuck on blues recently I let my sister pick the colour and she fell for this one. I doubt I would be making socks with this, I can envision a beautiful scarf or maybe a pair of warm mittens. 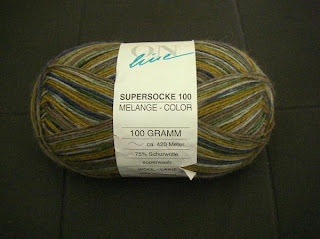 The colour of this yarn is 501 and here you can see all the subtle details of it. I am struggling to figure out the name of this one. I know it is German but would like to know how it is called. And finally, I could have not walked away from the gorgeous Fleece Artist Suri Blue (the colourway is called Dandelion). It will be definitely turned into a shawl some time soon. If you want to see other colours Fleece Artist makes this site has a beautiful collection with all the names.